Tako (Octopus) is daunting for those new to sushi or to making sushi as home. 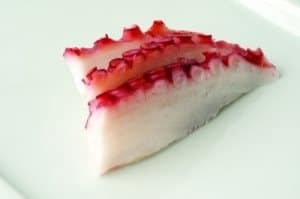 It looks strange to those unaccustomed to eating it, and has a chewy texture that requires thin slicing in order to be served as a sashimi dish. Tako is somewhat of an anomaly in the sushi world in that it is almost always boiled before consumption in order to bring out the faint flavors of the dish, and more important to tenderize the meat. Octopus is consumed throughout the world in a variety of dishes and styles of cooking, but ubiquitous to the dish is the need for tenderizing. Methods of tenderizing vary widely across the world, and often seem based more on superstition than fact (some chefs will tell you that it must be boiled in a copper pot, or that the only way to be certain is to throw it against a spotlessly clean sink four times in a row). The most common way for Japanese sushi chefs to prepare it is through a salt wash which gets rid of any remaining slime and viscera, and to then massage it with salt and chopped daikon radish. If this step is ignored, it can lead to a finished product that feels like you are biting into rubber. When prepared correctly, however, Tako is delicious served on its own, in sushi, or in salads. Tako is sourced from all over the world, with most of the product arriving from the Northwest coast of Africa. It is also commonly fished in Asian waters and the Mediterranean. It is then almost always processed in Japan, which is the hub of octopus preparation, freezing, and shipping. Octopus are short lived, and so do not accumulate the mercury the same way as large predatory fish with long life spans, and are high in protein. Nutritionally, octopus are a fairly low calorie meal. If you are able to get your hands on fresh Tako, count yourself lucky. It is a delicacy when prepared correctly, and is not as daunting as one would first think. If you do wish to try Tako sashimi, your best bet is a sushi restaurant where it will be sliced finely and expertly. It is not advised to try making Tako sashimi at home if you are not experience, where you are likely to slice off the tip of your finger or end up with too-thick rubbery chunks as you try to work with the slippery cephalopod.